Jamie bought this polka dot dress at a consignment shop–it had potential, but just wasn’t quite right. She is a performer (an oboist to be exact) and ideally wanted to be able to wear the dress to concerts and events, but hoped it could be a little more modern and fun. There had also been some (rough-ish) home improvements to the dress before she found it, so we needed to make sure we took the special care to get the dress up and running so it would last a long time. We started by fitting the sides and hemming the bottom with a slight high-lo hem. To finish it off, we slimmed and shorted the sleeves (oh boy! Those sleeves!) Now she has an adorable tailored polka dot dress to don for her shows, after which she can pair with statement jewelry and kickass shoes to head to a party! Do you have an old dress with oh-so-much-potential that is gathering dust in your closet and needs some updating or tailoring? 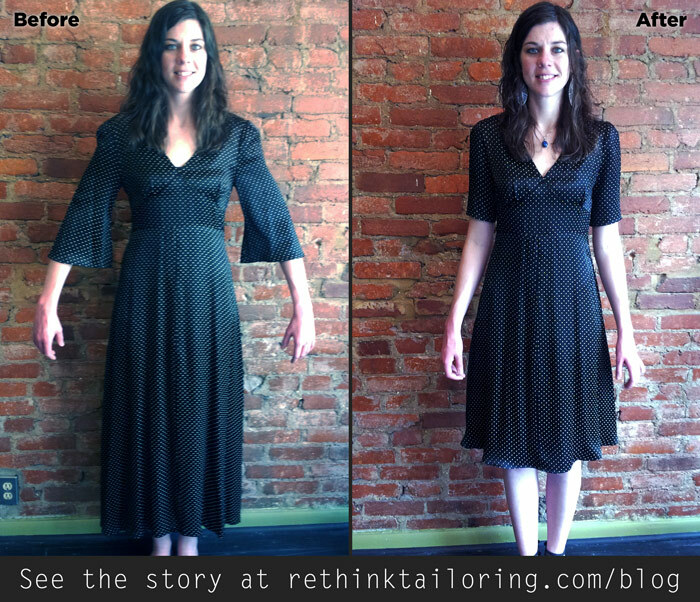 Tell me about it at kristen@rethinktailoring.com and we can see if there’s some revamp potential!